The german octopus Paul, catch all the results of South Africa 2010 World Cup games, gave champion to the red fury, and Spain with a 1-0 defeat in the final match against Holland. Congratulations to the “Red Fury”, Spain, the entire Spanish community in Uruguay, to the win, joining the elite group of eight countries that have won the World Cup Soccer. 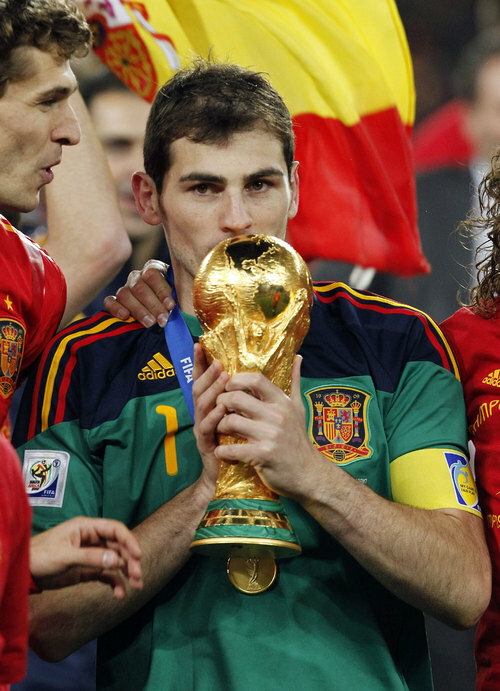 In this World Cup South Africa 2010, the big winner was Spain, the Spanish fury was felt, but lost the opener game against Switzerland, their fire has grown to make it to the final against Holland. Again, the Netherlands playing a final and being one of the best teams from around the world lost the final match, it seems that the Netherlands always fell in that last game. With Iniesta’s goal in overtime of 30 minutes, last minutes of the second half of extra time with a great shot, Iniesta gave the advantage to Spain, making the World Cup winner. In their celebration, the player took off his shirt of Spain, revealing a white T-shirt bearing the inscription of “Dani Jarque always with us” in memory of his great friend Daniel Jarque González player football more expertise as Dani Jarque or Jarque who suddenly died in Florence, Italy, on August 8, 2009. Today Spain celebrates, AUPA SPAIN, cost but you got it.